Nestled amongst trees, you will find this north facing, spacious two bedroom manufactured home enjoying a pleasant outlook towards the village’s pristine swimming pool. The home boasts a newly carpeted, spacious lounge and dining room with large tinted glass windows that create a light & airy home capitalising on the parks rural surroundings. The living area is equipped with ceiling fans and a reverse cycle air-conditioner for comfort. The modern kitchen has plenty of storage space and has rounded edge, blue/grey stone effect laminate bench-tops. Laundry facilities are provided in the good-size kitchen. The large master bedroom has built-in mirror door robe, ceiling fan and its own shower cabinet. 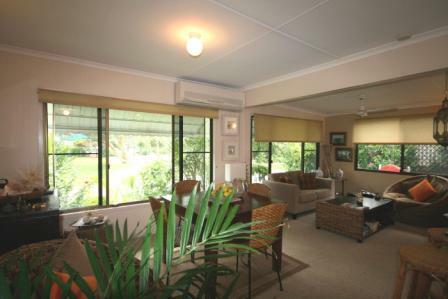 The second bedroom has a built-in robe and has a verandah door opening to the carport area. The bathroom comprises a bath with shower screen, vanity and toilet and there is a second guest toilet. The home has an entrance porch, gas-fired hot water service and a carport adjoins the home that has been partitioned to provide a single car space and a very private entertaining area. Over 50’s residential park, sorry no pets permitted.